Hmm. First off .. do NOT read this review if you have not yet read the previous books in this series! I love Laurell Hamilton. I have been seduced and enthralled with the Anita Blake, Vampire Hunter series. 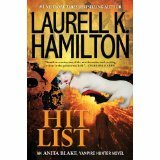 I have been looking forward to the release of Hit List for some time. With that said, this book has profoundly disappointed me. The phrase “love’s triangle” is a silly understatement when it comes to the relationships in Anita’s life. Although her latest books have become somewhat repetitious with the lustful scenes and never-ending additions to her sec life, it was a nice change to read a book in this series without having every 10 pages tossing you on a bed with two or more men. I think her main squeezes are amazingly wonderful, I do. I missed them in this book. It was nice to have the book centered more on Edward and the reality that revolves around him. There was not too much progression with Anita’s relationship with Edward. He cares for her, deeply. His two identities are merging a bit and that leaves them both slightly confused. Who is the bad guy? Well, that’s always the question when I start reading her books. The Mother of Death is devising a plan of destruction and will do whatever it takes to possess Anita’s body. What’s new? The book has several scenes that are boring and predictable. The ending? Well let’s just say .. after all the build up with this badass “Mother” .. everything is concluded within a few pages. Seriously? *sighs* I suppose the bottom line to this review, and I try my best to be as positive as possible, total let down. Bummer. 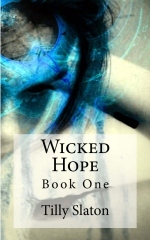 This entry was posted in Reviews and tagged Anita Blake, Hit List, Laurell Hamilton, paranormal romance, serial killer, vampire, werewolves, zombie. Bookmark the permalink. The book is a total curates egg good in parts. A great disappointment. Only one for those desperate for an AB fix, even they will want another book and go and start the series over. The earlier books where there were mysteries and investigation were better.